Mizuma Art Gallery presents “No Dress Code”, Okada Hiroko’s solo exhibition starting from 11 July (Wed.). In this exhibition Okada focuses on painting and the Human as a body, especially looking after the meaning of the acts of “painting” and “plastic creation” after having worked on photography, video and installations in recent years. In our time, artistic techniques are immensely diverse and choices left to artists almost infinite. This is for this reason Okada chose through her new series of works to give her own interpretation of “the human-painting relationship” and “the reconsideration of painting”. 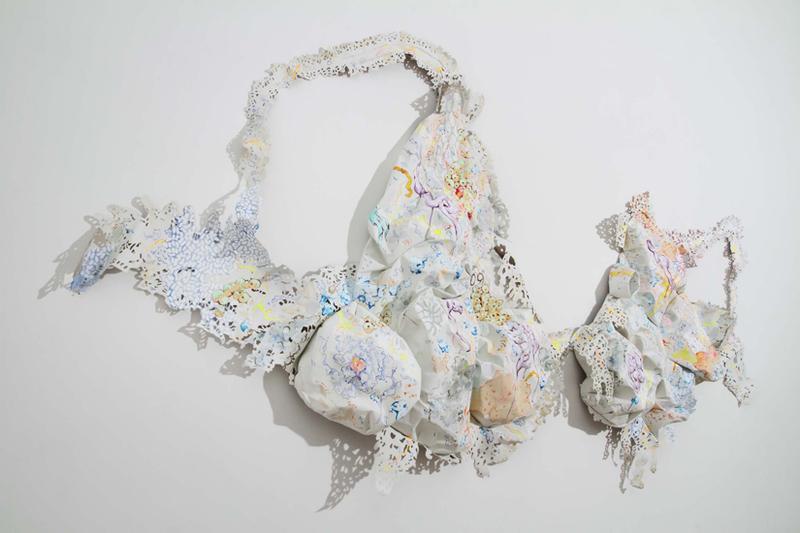 She goes back to the image of canvas as a fabric, like it was before it started being used for pictorial art in the 15th century, by creating barely defined loose objects, close to the body and resembling underwear or clothing. Okada thus deconstructs the support surface, an accepted characteristic of pictoriality, to create a three-dimensional world out of the bidimensional surface. Okada thinks of self-expression as the act of showing what is inside, bellow the layer of clothes we usually wear. She hopes it encourages the viewer and the artist to make one step toward each other, annunciating the birth of something. The exhibition title “No Dress Code” is associated with the new artworks visually reminiscent of the underwear and apparel constituting their motifs. However there are no rules to painting in the first place, and whoever wants to paint simply draw what they want to. “No Dress Code” means that there are no regulations nor prescriptions. This exhibition will be composed of 6 new paintings as well as related installations.